Blue Skies Country House - Theescombe Accommodation. Blue Skies Country House offers comfortable Bed and Breakfast accommodation for 26 people in 11 rooms at realistic prices. Enjoy the peace and tranquility of our 2 hectare garden near Kragga Kamma Road with a sparkling salt water pool and abundant bird life. Safe parking in front of your room in a securely fenced off garden. 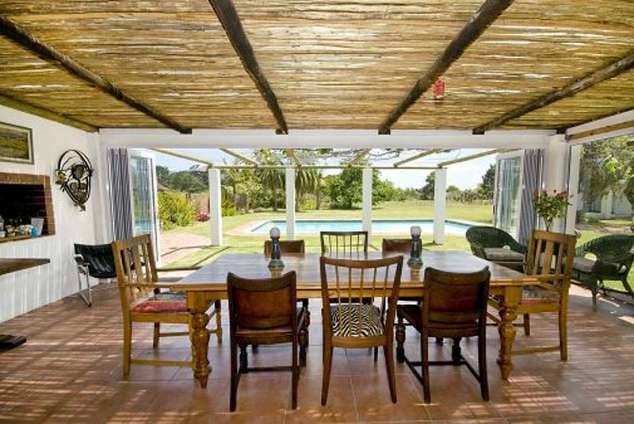 The Country House is situated on the outskirts of Port Elizabeth. Away from the hustle and bustle, but only 10 minutes away from the Greenacres and Walmer Park shopping malls. A 10 minute drive will bring you to the beautiful beach of Sardinia Bay and many other lovely seaside areas. There are two 9-hole Golf courses within 3 kilometres, the Kragga Kamma Game Park, hiking trails and country restaurants close by. There are numerous wedding venues in close proximity, so it is convenient for brides and bridal parties to prepare in one of our large garden suits or reserve the function room. The garden is lovely for prenuptial photos and also suitable for large groups of out of town guests attending the wedding. We have been popular with business people needing access to the industrial areas as we are close to the N2. This is also convenient for easy stop overs en route to Cape Town or Durban. We provide a full English breakfast in our breakfast room overlooking the pool and garden. A 2-course table d’ote dinner is available upon request at R75 per person. Braai and BBQ facilities are available and guests are welcome to entertain small groups of friends by arrangement. Our Function room is available for bridal parties to prepare, gatherings, meetings and conferences. 26809 page views since 12 Dec, 2003. Last updated on 23 Jan, 2019.